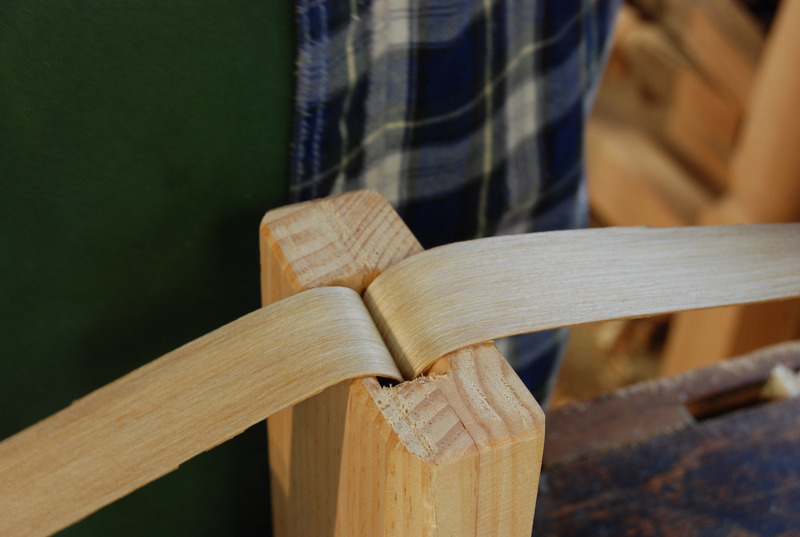 Remember those ash splints I pounded out this season? I’ve been little by little working some into baskets lately. But to do so, I have had to re-learn much of what I used to know in spades. 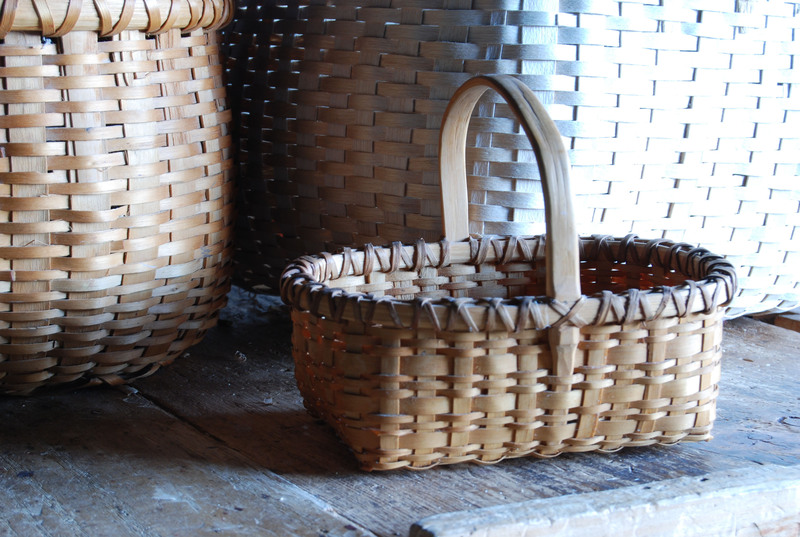 In the mid-to-late 1980s I made lots and lots of baskets, but since then I have only made a few each year. And those were fairly simple examples. But lately I have a renewed interest in them, so decided to get more involved in them. First thing, that meant re-acquiring some reference books – I had kept a couple of these, but then went out and ordered replacements for Shaker Baskets by Wetherbee & Taylor and A Key into the Language of Woodsplint Baskets. In the short video that my friend Rick McKee shot, I pounded the growth rings apart, then showed how to peel them in half, leaving a smooth, shiny surface for weaving. You can peel these bit by bit with your fingers, holding the splint between your knees like I do in the video, but it’s faster if you make a device that I think of as a tiny riving brake. 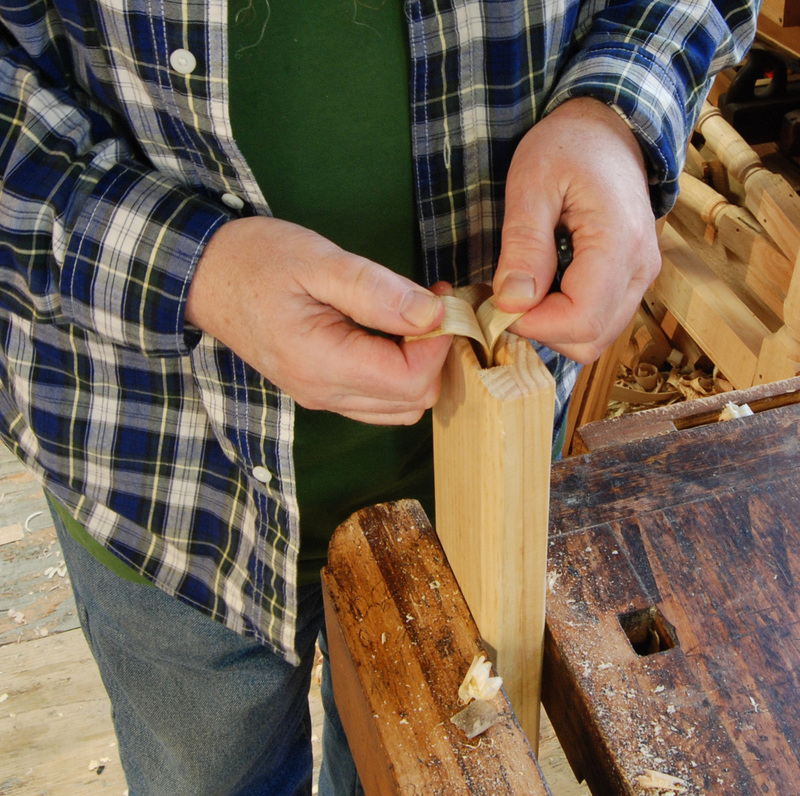 It’s two pieces of white pine, with a 2″ wide groove plowed in one, about 1/4″ deep. 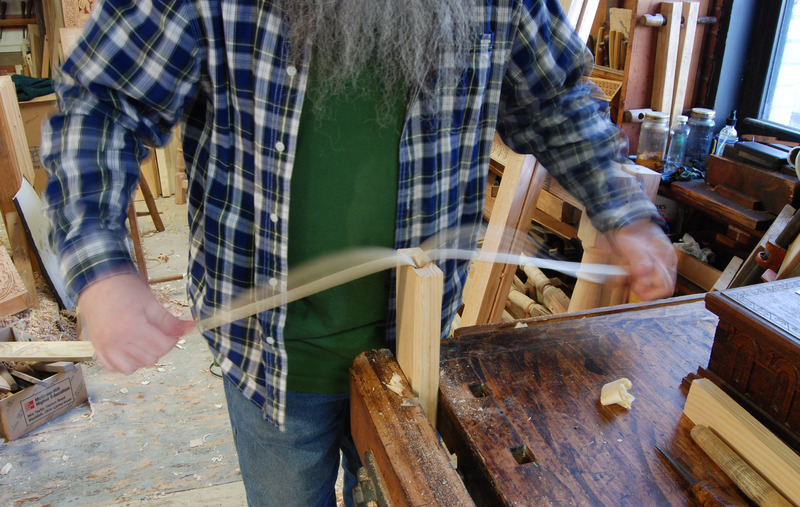 Then they are glued face-to-face, so the groove is now in the midst of the thickness. Soak the splint in warm water for a few minutes. 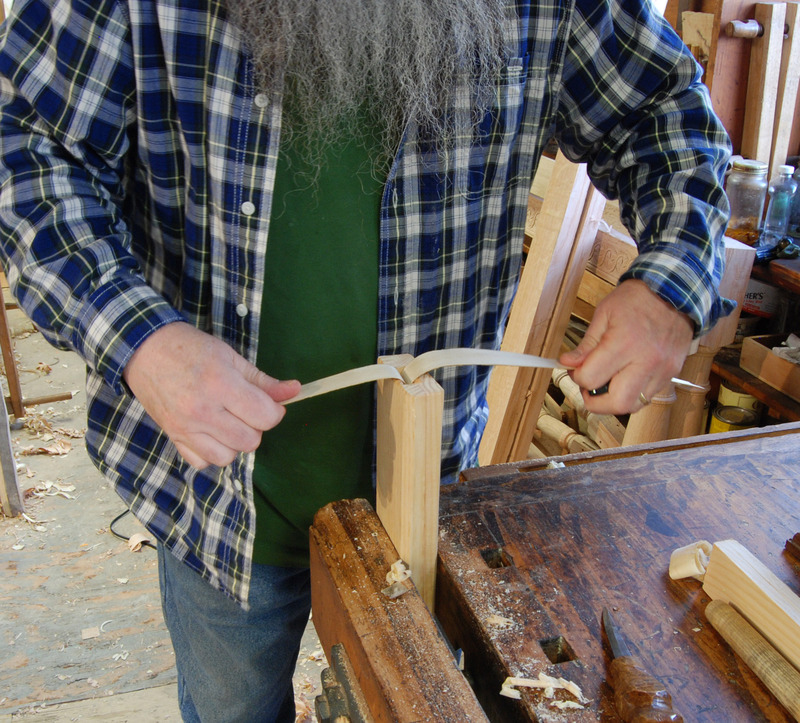 Then score the splint near the end to create a tab to begin pulling it apart. Slide it up through the slot in the pine boards. Now pull quickly, spreading your arms full-width. Presto! Here’s a detail shot, showing the surface of the inside of the splint. Here’s one of my old basket, showing a detail of the attachment for the swing handle. I learned this one from the book Legend of the Bushwhacker Basket, by Wetherbee & Taylor. 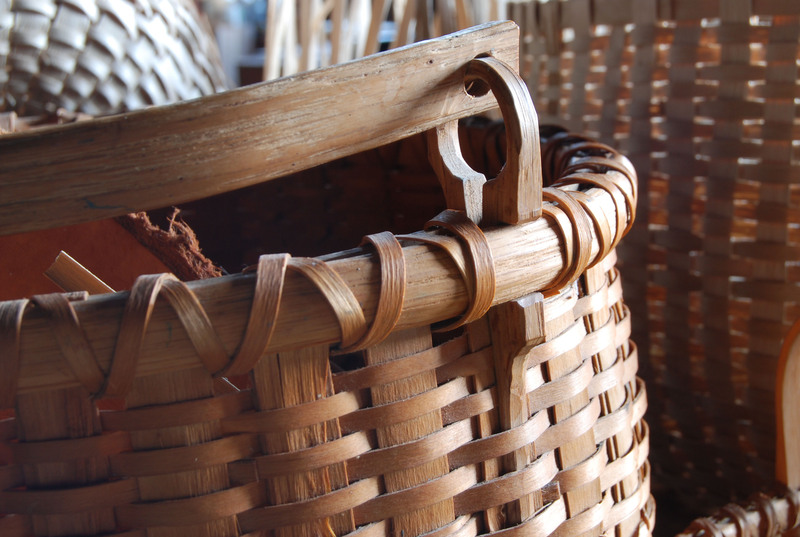 I’m going to make a couple of these this winter…the basket is ash, the handle & “ears” are white oak. Lashing is hickory bark. A small favorite over the years – it’s made it on the blog before here & there. Ash, with hickory rims and bark lashing. So there will be more of this when I get a bit further along. Is there such a thing as a basket made from inner bark only? 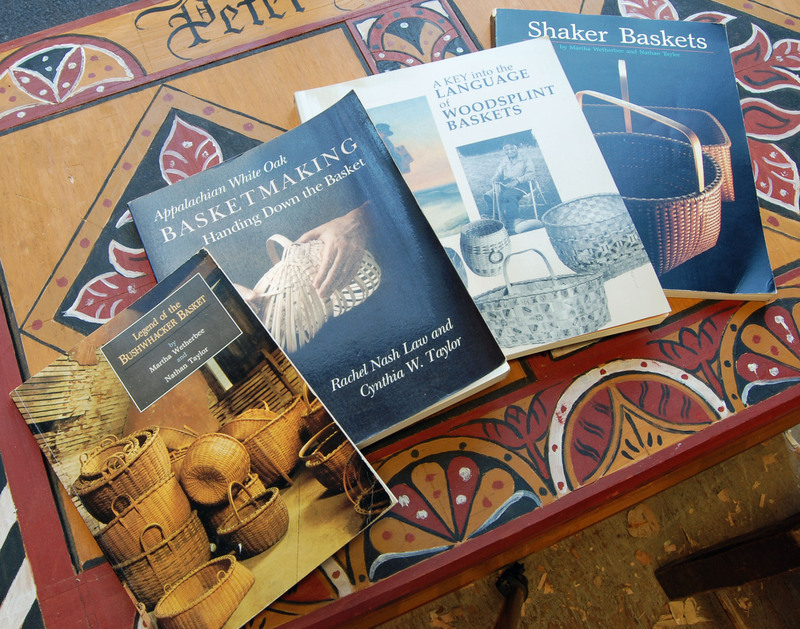 The McMullen book on New England Native American baskets is excellent, and so is the bushwhacker book. I never saw anybody using a crooked knife so I don’t have a clue about them. “the key to the language” is one of the best books on native splint work there is. it’s a good one. I love the ash splints video. Is the timber green or dry? PS: I live about 10 miles away from Marhamchurch Antiques! 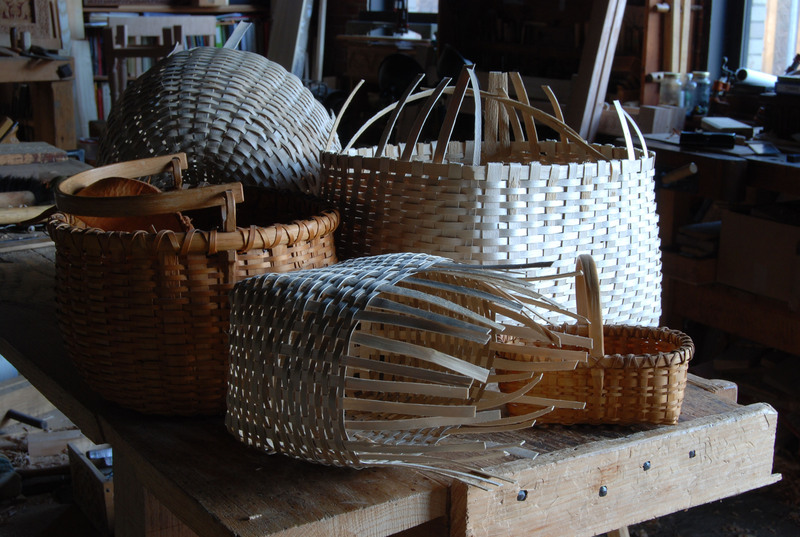 I remember that, back in the ’70s, UConn, in its School of Agriculture, had a basket-making course. At the time, it was the object of humor about “gut” courses; I wonder if that would happen now? I wonder if the course survived? Funny how things turn out – once the worst thing I could be was square and now it’s the thing I work for the hardest. Peter had this blog article about ash splints and since my friend Monica and I were just talking about it I thought I would reblog it here for her to see. Fascinating. Is ash the wood of choice, or are others suitable? And the lashed loop at the top of the basket, it that also ash?